Hidden treasure, pirates, time travel, and friendships that span the centuries. That’s what Johnny Vic’s Nautical Adventures is all about. Johnny Vic . . . historical fantasy at its best. For all ages. 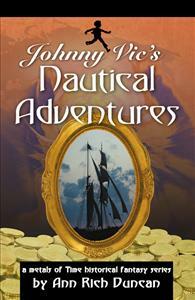 In Johnny Vic’s Nautical Adventures, our hero’s magical metal detector sends him on two adventures: Champlain Gold, and COLUMBUS!. Johnny Vic heard that Jesuit priests hid gold on the shore of Lake Champlain. Will he find it? You bet! And, since it’s October 11, 1775, he’ll witness the famous Battle of Valcour. Cool! Then, he’s propelled onto the deck of a schooner on Lake Champlain. Now, if there were pirates on the lake, do you think Johnny Vic would run into them? You bet! And in COLUMBUS, he gets caught in a raging storm, with Christopher Columbus at the helm! Johnny Vic’s Nautical Adventures. Don’t miss ‘em!